With so much talk about Salt Lake City’s poor air quality, it might feel like everyone else is telling you what to do—drive less, walk more, don’t idle, stay inside, think green. While individual actions play a crucial role in reducing the pollutants that get trapped in our valleys, you’re not the only one who can and should make a difference. At SLCGreen, we recognize that only through collective action at every level and in every sector can we see real change. 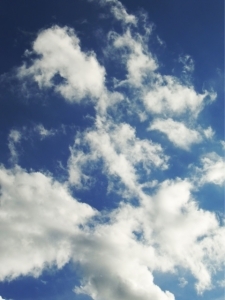 LEED Silver Standards for all new city buildings and major renovations. Meeting these minimum standards reduces the impacts of construction, sources more sustainable materials, and improves water and energy consumption throughout the life of the building. The latest example is the new Public Safety building on 500 South, which will generate as much electricity as it consumes, making it the first public safety building of its kind in the nation. City and County Building Efficiency Upgrades. Recognizing that much of our electricity comes from burning coal, we’ve been working over the last decade to reduce the electricity consumed by our existing buildings. The City-County building downtown, home to the Mayor’s office, has reduced its electricity consumption by 840,000 kilowatt hours per year thanks to upgraded lighting and building systems. This is a reduction equivalent to the electricity consumed by 89 homes in one year. 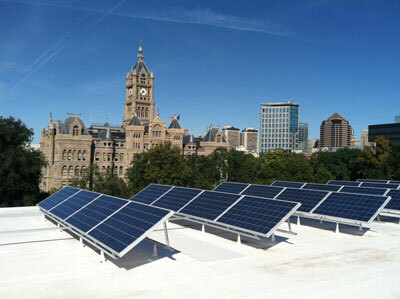 Solar installation on the top of The Leonardo, with a view of the Salt Lake City-County Building. Fuel Efficient City Vehicles. The city has a lot of vehicles out on the streets that contribute green house gas emissions along with everyone else. To curb our carbon, we’ve introduced 16 compressed natural gas (CNG) trucks to replace diesel sanitation trucks, added 5 hybrids and 2 rechargeable electric cars to the Police Department fleet, and changed over 25% of the Airport’s vehicles to CNG. Thanks to the Sustainable SLC Plan 2015, this is just the beginning. Read more about doing your part. Forrest, thank you for catching that. The link has been updated!